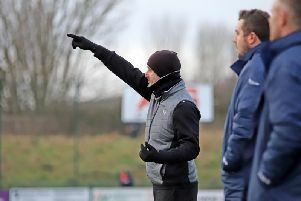 Dan Holman insists Kettering Town must look no further ahead than the next game in front of them as they bid for the Evo-Stik League South Premier Division Central title. The Poppies hold a five-point advantage at the top of the table and have two games in hand on second-placed Stourbridge in what has become a two-horse race for the sole automatic promotion place. 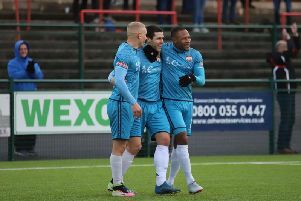 Marcus Law’s team made it four wins in a row with a 4-1 success at Redditch United last weekend, a game in which striker Holman grabbing his 13th goal for the club since arriving at the beginning of November. With the finishing line now approaching, the calculators are being readied as fans begin to look at what might be needed to secure promotion. But Holman simply wants to focus on the job at hand. Kettering make the short trip to St Ives Town on Saturday as they go up against a team who claimed a 3-0 win at Latimer Park in November. It was a particularly bad day for Holman as he was sent-off for a challenge, only for the red card to be rescinded during the following week. But revenge isn’t his driving force as the two clubs get ready to lock horns again. “It was a strange game and it came in that time when we were conceding a lot of goals,” the frontman said. “We were going through a tricky period that every team goes through. “I got that red card, which was proven to be the wrong decision, and I think we missed a penalty as well so you kind of knew it was going to be one of those days. “But we got over it and it hasn’t been sitting on my mind. “We have just got to go there and try to carry on playing the way we have been. “We are doing really well to be fair. We had a bit of a sticky patch but I think the (2-1) win at Stourbridge and how dramatic it was has really pushed us on. “It’s a boring cliche but we just have to take each game as it comes. “We have got games in hand but we haven’t got those points yet so all we can do is try to tick the games off one-by-one and not think about anything else. “You see the same thing happens with teams when they are fighting relegation. They see that finish line and that’s when things really pick up. As far as last Saturday was concerned, Holman was pleased with an impressive win at Redditch. And, with another goal to his name, he is pleased with the contribution he has made to the Poppies’ cause so far. “It was a good win at Redditch, I thought we dealt with the 4G surface a lot better than we did the last time we played on one and we came through it,” he added. “It’s always nice to get a goal and I am pleased with how I have done so far here. “There is always going to be pressure on any striker when they come into a new club and, although I dropped down a level or two to come here, you have to produce.